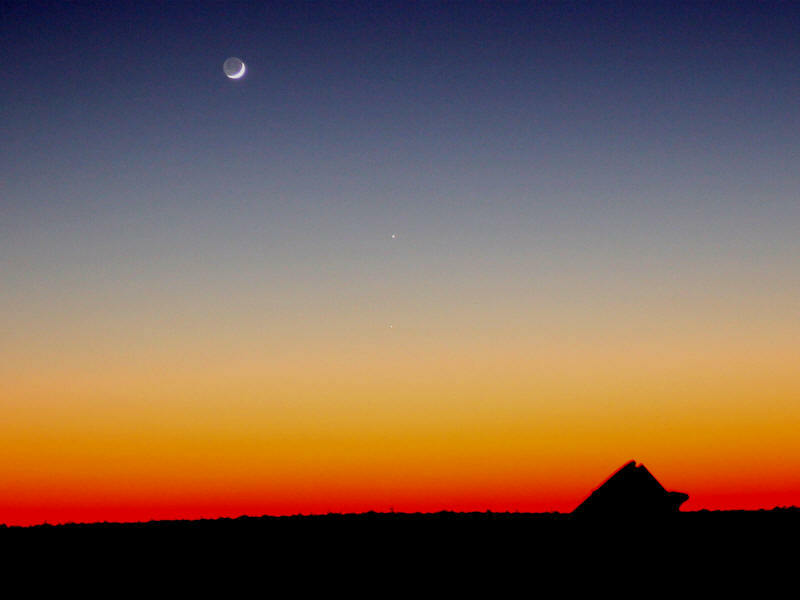 On December 29, 2008 at 5:29 pm, Jim Mack imaged the crescent Moon with attendant planets from Coyle Field in the Pygmy Pines of New Jersey. Venus is the bright object in the upper-left corner of the frame. Jupiter and Mercury are in the bright twilight below and right of the Moon -- scroll down for a close-up view of them (click the image for a larger version, about 400K). Exposed 2 sec at f/3.5, ISO 400, with a Canon Digital Rebel XSi and a lens set to 22 mm focal length. A close-up crop of the lower-right section of the previous picture which better shows Jupiter above Mercury (click the image for a larger version, about 350K). The next evening, December 30, 2008, Joe Stieber captured the same grouping from Maple Shade, NJ, at 5:29 pm. The Moon has moved noticeably eastward towards Venus. 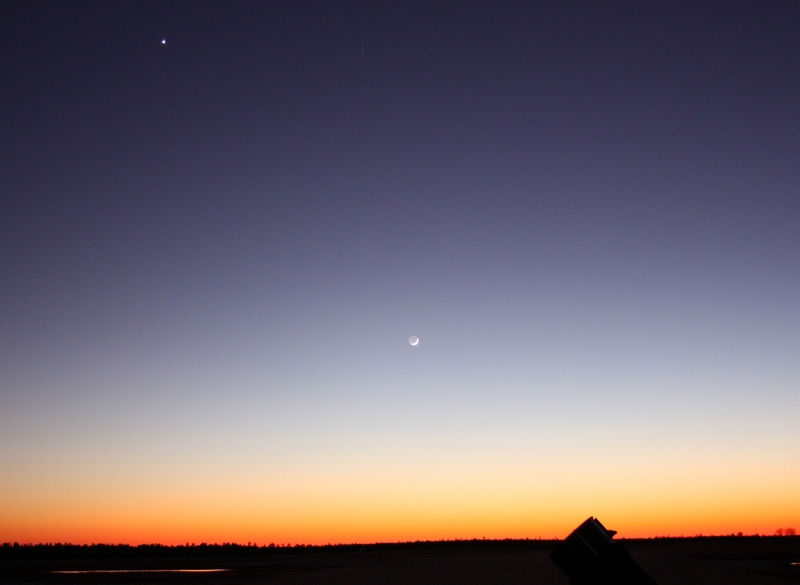 Scroll down for a close-up of Jupiter and Mercury (and further down for Neptune). Exposed 1 sec at f/8, ISO 400, with a Canon 40D digital SLR and a Sigma 18-50 mm f/2.8 zoom lens set to 31 mm focal length. A close-up Jupiter and Mercury (cropped from the bottom right corner of the frame above). Notice that compared to the previous evening, Mercury has moved from the six o'clock to the seven o'clock position relative to Jupiter. Neptune is also present in the field near Venus (but certainly not a naked-eye object as were the other three planets!). Here's a telephoto image of the area near Venus taken at 6:35 pm. Exposed 4 sec at f/4, ISO 800, with a Canon 40D digital SLR and a Canon 70-200 mm zoom lens set to 140 mm focal length. 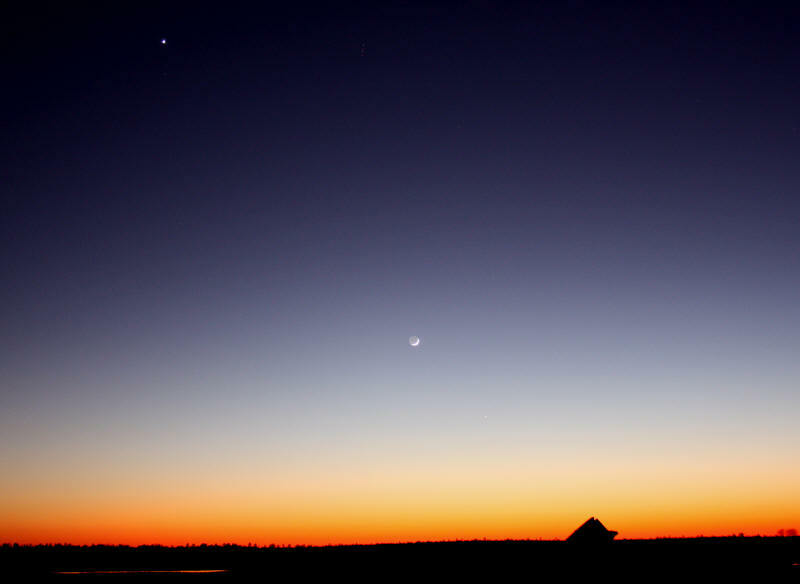 From Maple Shade on Wednesday, December 31, 2008, Joe Stieber again imaged the Moon and Venus, which were just 3 degrees apart, at 5:29 pm -- not long after their conjunction at 4:05 pm EST. Exposed 1/100 sec at f/5.6, ISO 400, with a Canon 40D digital SLR and a Canon 70-200 mm f/2.8 zoom lens set to 200 mm focal length. Moments later, the exposure was increased to show the earthshine on the moon (this image is more suggestive of the brilliant naked-eye view at the time). Iota Aquarii is the 4.2 magnitude star at the 10 o'clock position from -4.3 magnitude Venus. Exposed 1 sec at f/4, ISO 400, with a Canon 40D digital SLR and a Canon 70-200 f/2.8 zoom lens set to 145 mm focal length. By January 1, 2009, the moon has moved further eastward past Venus. This picture was taken by Joe Stieber from Longwood Gardens in Kennett Square, PA, at 5:14 pm with a Canon 40D digital SLR and a Sigma 18-50 mm f/2.8 zoom lens set to 18 mm focal length. Exposed 1/6 sec at f/2.8, ISO 400 (handheld). At 8:13 pm, only the low-altitude crescent moon remains behind some of Longwood's festively illuminated trees (at the upper-left of the branched tree). Exposed 1/8 sec at f/2.8, ISO 800, with a Canon 40D digital SLR and an 18-50 mm Sigma zoom lens set to 18 mm focal length.